Demonetisation has brought out the weirdest stuff from some people. Most politicians in the Opposition had their brains go haywire as did many usual suspects from the MSM. The weirdest demand of the Opposition was that since PM Modi made the announcement himself only he must answer in the Parliament. Whether you are for or against it one has to admit that Modi sold it well. He made the “Sudden-death” demonetisation announcement himself. He followed it up with speeches at various rallies in Goa, UP and Maharashtra. He even spoke about it from Japan. In contrast, the Opposition had the worst voices of Rahul Gandhi, Arvind Kejriwal and Mamata Banerjee ranting and almost throwing tantrums like spoilt kids whose chocolates were stolen by Modi while they were sleeping. Sane logic and reason wasn’t forthcoming from even a single Opposition leader. “India is under threat. Cyber security is under threat. Cyber security comes into focus only when India is moving to a digital and cashless economy? And why? Just because Rahul’s account got hacked? Where were these jokers when thousands of emails of Hillary got hacked? Where were these Pappu-clones when Wikileaks was releasing classified nuggets from hacked sites and accounts. None of these jerks then screamed “DIGITAL EMERGENCY”. Even Hillary Clinton or the US govt which was most affected by these hackings did not scream “DIGITAL EMERGENCY”. Our politicians and journos are a bunch of weirdos when their darling party is out of power. 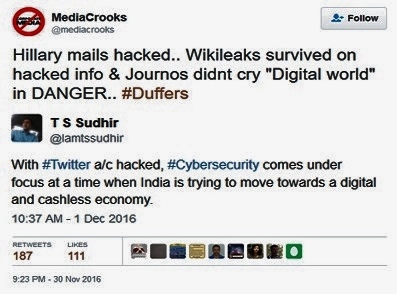 I could go on and on but hacking is not new and the way the Congis and some media morons are ranting it lends to the suspicion that this whole thing is an “Inside job” to create an issue and indulge in fear-mongering over Modi’s push for a bigger digital economy. has fallen Below Poverty Line in ideas to combat Modi”. I have to laugh. These silly Congis and dumb media folks can only scare young school-girls with their alarmist idiocy. RahulG features in a video where he even copies a condolence message from text on his mobile and Jyoti Scindia still says he doesn’t believe it despite the video evidence (Check it out here). 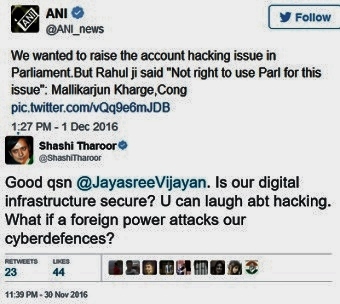 I wonder why anyone would even want to hack RahulG’s account when half the time he talks and acts like his brains were hacked. Little do these silly Congis, their media-slaves and assorted Opposition ranters realise that the more they indulge in bogus tantrums the more they lend strength to Modi and his reforms. They are alienating the public at large. You go to a restaurant or hotel there’s usually a sign that says “Management is not responsible for your personal belongings”. You park your vehicle in a parking lot the sign says “We are not responsible for your vehicle”. Same goes for digital or online transactions and accounts too. YOU TAKE CARE OF YOUR OWN ACCOUNTS as best as you can. A person uses all the security measures possible and provided and Twitter too provides certain security features. There is no DIGITAL EMERGENCY or Emergency of any kind. The only Emergency is in the heads of Congis who desperately need a surgery. 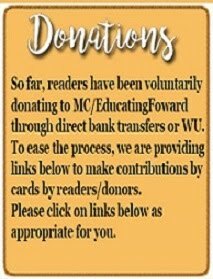 As usual well written article. But congressi foot soldiers like Dr Ajoy Kumar will fail to see any reason or logic behind their moronic tweets, or is it that they see but are afraid to tweet the logical things to keep their bosses pleased. Awesome articulation.. They went devil to deep s**t.. Now desperation shows up.. They never grow up..
No doubt. 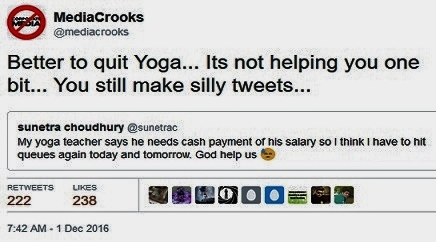 The timing of this hacking job clearly suggests that this is the "INNER WORK" of one of the crook stupid pappu advisers. But as usual it will boomerang and hurt only their pappu and congress. Nowadays we the people have become mature to decode these type of drama's very early due to Ravinar ji's years of exposing these crooks about their every crooked nautanki. Wish the email of Pappu's Venuzeulan girl friend email id is printed to give some titillating humor !!! Actually what they are worried about is emails becoming public...But as usual we will never know...Netas protect each other whichever party they belong to...Even Trump says he is not going to prosecute Clinton now after the elections...Before the elections he was saying Jail term for crooked hillary.. Yet it cannot find where the G family's corruption money is parked? They cannot find where corrupt neta's money is parked? Not a single neta has been exposed? Raaabert is still cocking a snook at the the Mango People. This is what is disturbing. People crying about "Cyber Security" should first pause to think about real life comparable crimes in our daily life. There would be hundreds of thousands of UNREPORTED incidences of PICK POCKETING Folks have so much confidence in Police that they believe the stolen wallet will never be found or if found they would not get their cash back. The Cops would have caught the known pick pocket and shared half of the loot. There are many such scenes in Hindi cinemas.Add a large number of Robberies,Dacaities,Bank Heists,Muggings etc. With Digital Cyber World we have to expect & accept that the criminals from the real world have also adapted to Cyber World. 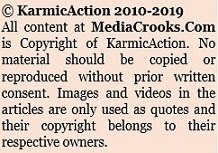 There is a small consolation ( if it can be considered as such ) - Nobody gets hurt or is killed "physically" in Cyber World. The biggest looters of India are Khangress party & there was no looting emergency declared. Ravinar has hacked into Pappu's brain that is why he gets those brilliant phrases endlessly one after the other. Now every 10th Class text book should have a chapter on Pappu jokes, who ever scores 10/10 would get some additional grace marks in his subject of choice. Nothing could have been more appropriate than what has been written. It is not only the Congis but the entire opposition barring some like Nitish who have been behaving childishly. Max histrionics and theatrics are by Congis, TMC and of course AK. I feel so sad that the polity in this country has fallen to such low levels. Some online hacking happens even in advanced places like the US and Europe. With a little common sense people can avoid falling for most for it. I get many fraudelent emails from time to time but I avoid them. It does not mean one has to stop using the internet. It is akin to stopping driving or flying because one might be involved in an accident or crash or even slicing an onion because one might get cut. Yesterday there was a news report in the Times (UK)that the nuclear waste from UK power stations may be converted into energy ball batteries lasting 5000 years. However, amazingly over here, presstitutes and sickulars want banning online transactions! Modiji will not get distracted by these lowlife. It is very curious that RaGa's twitter account was allegedly hacked during this period, when the cashless/digital payment issue is being discussed. I, for one, smell something fishy. If I believed all spam mails promising me hefty prizes/awards, I would have been the richest person in India. One has to use brain to be safe to the extent possible. There are thumb rules for cyber security and one should follow them. Very good and timely post. I wish there is something soon on Mamata's tantrums and unwarranted coverage of her stupid histrionics by MSM. Shashi Tharoor Twitter account was hacked. His ex & late wife account was hacked. He did not cry of defense accounts getting hacked. Actually Italian Bar Maid Ammi must have ordered him to keep off from Twitter accounts & concentrate on " pappu studies" so Pappu is crying foul. The video evidence of copy & pasting the condolence message was fantastic. Would invite the journalist who has taken the video for a full night festive paid dinner for his entire family at a place of his choice. Now Kujriwal & Pappu are fighting for the best attention of Italian Bar Maid affections, as to who is the best son & they are out beating each other to be the ELDEST. Pappu logged into his Twitter account. Twitter replied - Password is INCORRECT. 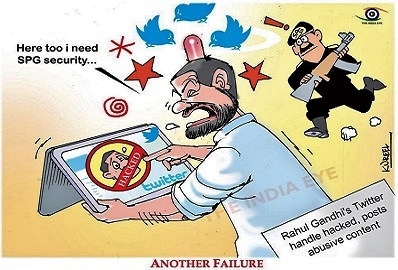 Pappu entered the password again - INCORRECT and computer crashed. = real story - Twitter humor. Congress members follow Mahatma Gandhi's three moneys, see/hear/ speak (communicate) no reason (logic). Since rahul has sudden new found love for standing in lines like atm...he shd first follow legal process of complaining to twitter n fir with cyber security cell...this way he will get in the queue of 1000s others before him who have been hit with much more grave cyber crimes like money frauds etc...khade raho queue mein ,tumhara no ayega,...hahaha. hypocrasy of rahul...when he faces twitter hack he wants to cut the line and directly want parliament to solve his prob first..where ur love for queues now rg??? Couple of hours before actual hacking took place, Digvijay Singh hinted about possibilities of hacking. And within two hours after hacking many Congress leaders started blaming Digital world using almost exactly the same language. Choreographed? but the BHARAT DURGHATNA AWARD of the day goes to our very own Mamata Didi. Most shameless of all is Manmohan Singh the greatest economist ever born whose speech in RS was full of only jealousy and hatred of Modi.The man who allowed the greatest national robbery like CoalG,2G,CWG just to please Sonia G today talks of loot.Shame on him. This Pappu gets tution from a galaxy of crooks,Sibal,Jairam,Church fellows,so on still can't improve. You are too good Ravinar. I think everyone should read your columns including Rahul and Modi. I read your columns to keep myself happy. In addition,https://www.jetwin.com/en-us/bitcoin-casino bitcoin transactions take a long time because license terms and typical latencies are not associated with complications.